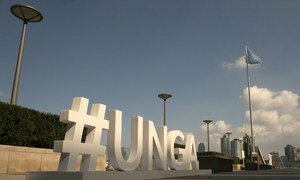 Prime Minister Benjamin Netanyahu of the State of Israel addresses the seventy-third session of the United Nations General Assembly.. 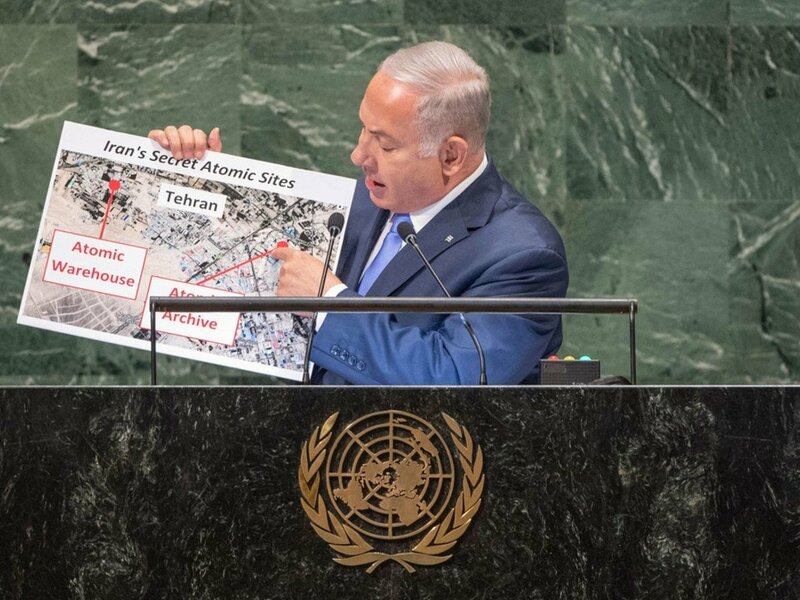 Displaying photographs from the podium of the United Nations General Assembly, Israeli Prime Minister Benjamin Netanyahu on Thursday accused Iran of maintaining a secret atomic warehouse in Tehran, proving its intent to develop nuclear weapons despite the accord it reached with major powers in 2015. “Today, I’m disclosing for the first time that Iran has another secret facility in Tehran, a secret atomic warehouse for storing massive amounts of equipment and material for Iran’s secret nuclear weapons programme,” he told world leaders on the third day of the Assembly’s annual debate. The Joint Comprehensive Plan of Action (JCPOA) – reached by Iran, China, France, Germany, Russia, the United Kingdom, the US and the European Union – sets out rigorous mechanisms for monitoring restrictions placed on Iran’s nuclear programme, while paving the way for the lifting of UN sanctions against Iran. Mr. Netanyahu, who from the start has opposed the accord, said Iranian officials were now “scurrying back and forth” trying to clean up the site, removing 15 kilogrammes of radioactive material last month. “Now the Iranian officials cleaning out that site still have a lot of work to do because they’ve had at least 15 ship containers – they’re gigantic – 15 ship containers full of nuclear-related equipment and material stored there,” he said. “Now, since each of those containers can hold 20 tons of material this means that this site contained as much as 300 tons of nuclear-related equipment and material,” he added, praising United States President Donald Trump for renouncing the accord, warning the Europeans against appeasement, and calling for stiff new sanctions, such as the US will impose in November. “So, here’s what I say to Europe’s leaders and to others: Instead of cuddling Iran’s dictators, join the US and Israel and most of the Arab world in supporting new sanctions against a regime that endangers all of us in all of the world,” said Prime Minister Netanyahu. “I also have a message today for the tyrants of Tehran. Israel knows what you’re doing, and Israel knows where you’re doing it. Israel will never let a regime that calls for our destruction to develop nuclear weapons. Not now, not in 10 years, not ever,” he stressed, accusing Iran of using the money obtained from the lifting of sanctions to spread death and destruction throughout the region. But, Mr. Netanyahu said, the Iran deal has had at least one unintended, positive consequence. “By empowering Iran, it brought Israel and many Arab states closer together than ever before in an intimacy and friendship that I have not seen in my lifetime and would have been unimaginable a few years ago,” he declared.